Discover the thrill of big game hunting in Alaska's interior or viewing bears on Kodiak Island. Visitors from all over the world come to Alaska Adventures Unlimited to hunt, fish, and explore the world's wild places. The Alaska Range is located about 100 miles south of Fairbanks in the interior of Alaska. Tom Kirstein leads hunts in a spectacular area close to Denali National Park. This part of Alaska has a long history of producing trophy game going back to the Gold Rush. The area is perfect for hunting Dall sheep, moose, caribou, wolf, grizzly bear, and black bear. Tom leads hunts using saddle and pack horses to access spoke tent campsites in remote mountain country. The fall hunting season runs from August 10 - September 20. August is best for Dall sheep, while September is primarily for moose, grizzly bears, and combination hunts for multiple species. Our hunting area on the Alaska Peninsula is known as the Ugashik River and is located 100 miles south of the community of King Salmon. This area has a healthy bear population and is perfect for any hunter who wants to harvest a trophy brown bear. Visitors should fly to King Salmon and travel to meet Tom in Ugashik Village. He has a nearby camp with comfortable cabins that make the perfect home base for Alaska Peninsula adventures. Tom has been hunting at this location since 1986, and he knows the terrain intimately. Hunting on Kodiak Island takes place at the famous Deadman Bay Bear Camp, which is located 90 miles from Kodiak City on the southeast end of the island. Established in the 1940s by Master Guide number one, Hal Waugh, this is the oldest established bear hunting camp in the Kodiak National Wildlife Refuge. At this location, there are excellent populations of brown bears, mountain goats, and Sitka black-tailed deer. 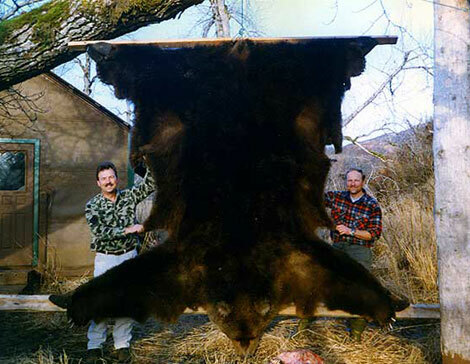 The area offers the best trophy hunting opportunities for all of these species and has produced many record trophy bears. Bear viewing trips are also available. Remember, Kodiak Island is the only place where Kodiak bears come from!